I have been diagnosed with a thyroid nodule, what should I do? Thyroid nodules are common. Studies have shown that 19% – 67% of randomly selected individuals will have thyroid nodules detected with ultrasound (1). They are more common in elderly persons, in women, in those with iodine deficiency and those with history of radiation exposure (2). If patient found to have thyroid nodule on physical examination, thyroid function test, measuring serum TSH level, has to be checked first and then thyroid ultrasound should be performed. Ultrasound is the most sensitive test to evaluate for thyroid nodules. Generally, only nodules larger than 1 cm should be evaluated, because they have the potential to be clinically significant cancers. Occasionally smaller nodules require evaluation if they have suspicious ultrasound characteristics, patient had history of head and neck irradiation or a positive family history of thyroid cancer (2, 3). Next step in diagnostic evaluation of thyroid nodules after thyroid ultrasound is fine needle aspiration (FNA) of the nodule or nodules. It is the procedure of choice and the most accurate method for evaluating thyroid nodules. Ultrasound guidance is important in performing FNA biopsy. The number of cases in which sufficient samples are obtained increases if aspiration is guided by ultrasonography, especially in nodules that are partially cystic (4, 5). In order to improve accuracy of the biopsy, on site cytologist can evaluate the biopsy sample for adequacy, sufficient amount of material can be obtain and it will decrease the rate of non-diagnostic biopsies. As it was mentioned above, the majority of thyroid nodules are benign. Nevertheless, thyroid nodules diagnosed as “benign” require follow-up because of a low, but negligible, false-negative rate of up to 5% with FNA biopsy. This means that despite “benign” result 5% of the patients still may have cancer (6, 7). It is recommended that serial ultrasound be used in follow-up of thyroid nodules that were diagnosed as benign on the first FNA biopsy to detect changes in size. After the first thyroid ultrasound that detected thyroid nodules and FNA biopsy, follow-up ultrasound should be repeated in 6 months and once a year thereafter, if there are no changes (5). Benign nodules may decrease or slowly increase in size with the time. Nodule growth is not itself an indication of malignancy, but growth is an indication for repeat biopsy. Increase in size of the nodule by 20%, calculated by volume of the nodule (three dimension measurements) is considered clinically significant. The false-negative rate for benign thyroid nodules on repeated FNA biopsy is low (2). Some data in thyroid nodules greater than or equal to 4 cm indicated that the incidence of carcinoma is high with a high false-negative rate for preoperative benign cytology. Base on that some surgeons considered performing diagnostic lobectomy regardless of FNA biopsy results (even if it is benign) for thyroid nodules greater than or equal to 4 cm (8, 9). 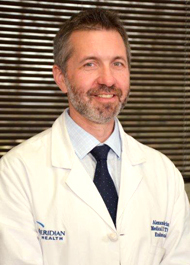 Read Expert Article on Meridian MOMTOURAGE by By Alexander Shifrin, M.D., FACS "Do You Have a Thyroid Nodule?" 1) Tan GH, Gharib H. Thyroid incidentalomas: management approaches to nonpalpable nodules discovered incidentally on thyroid imaging. Ann Intern Med. 1997 Feb 1;126(3):226-31. 2) Cooper DS, Doherty GM, Haugen BR, Kloos RT, Lee SL, Mandel SJ, Mazzaferri EL, McIver B, Sherman SI, Tuttle RM; Management guidelines for patients with thyroid nodules and differentiated thyroid cancer. American Thyroid Association Guidelines Taskforce. Thyroid. 2006 Feb;16(2):109-42. 3) Gharib H, Papini E, Valcavi R, Baskin HJ, Crescenzi A, Dottorini ME, Duick DS, Guglielmi R, Hamilton CR Jr, Zeiger MA, Zini M; American Association of Clinical Endocrinologists and Associazione Medici Endocrinologi medical guidelines for clinical practice for the diagnosis and management of thyroid nodules. AACE/AME Task Force on Thyroid Nodules. Endocr Pract. 2006 Jan-Feb;12(1):63-102. 5) Hegedüs L. Clinical practice. The thyroid nodule. N Engl J Med. 2004 Oct 21;351(17):1764-71. 6) Thyroid. 1998 Apr;8(4):283-9. Ultrasound-guided fine-needle aspiration biopsy of thyroid masses.Carmeci C, Jeffrey RB, McDougall IR, Nowels KW, Weigel RJ. 7) Fine needle aspiration of the thyroid: a cytohistologic correlation and study of discrepant cases.Ylagan LR, Farkas T, Dehner LP. Thyroid. 2004 Jan;14(1):35-41. 9) Pinchot SN, Al-Wagih H, Schaefer S, Sippel R, Chen H. Accuracy of fine-needle aspiration biopsy for predicting neoplasm or carcinoma in thyroid nodules 4 cm or larger. Arch Surg. 2009 Jul;144(7):649-55.